There are 2 Levels of Complimentary Experience very relevant to the difference of DCarsonCPA on support lines for cross sector Entity and Individual, Family, Community and Societal needs in the Economy and Financials. The Value and Evolution of Applied Research AND the Strong Base of Audit - CFO and Lean Management Consulting for Boards, Directors and C-Level Executives and a passion for mapping to our optimal lines on performance in the Economy and Financials with continual engineering for project and process improvements, change management and growth in this knowledge age in the Economy and Financials (We take that knowledge to services to help on needs). 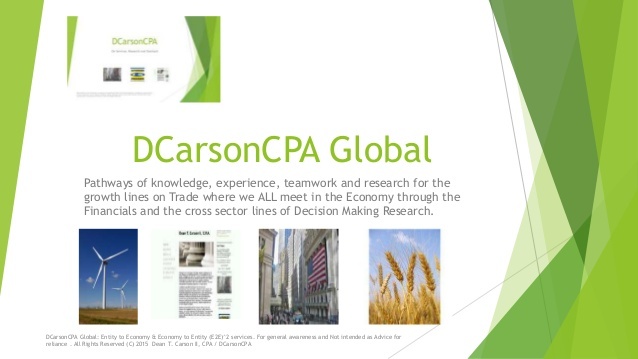 See DCarsonCPA by LOBs - to get a sense to the depth and perspective of knowledge and research we can bring to needs on Lean Consulting, Advisory and Project needs. The same knowledge permits to launch lean teams for immediate needs on projects with a high value of infused knowledge and training for lean deployment with deep support on knowledge lines. The Evolution of DCarsonCPA began as a line of integrated support line for Lean Project, Process and Advisory Services for the anticipated lines of support to Accounting, Taxes, Advisory and Audit but also coincided with a time of significant personal and professional growth AND a driving will to help on cross sector challenges in the Economy on Labor, Participation and the efficient match of supply and demand in the Economy and Financials out of a drive to help for the needs of Individuals, Families and Communities in the Economy and Financials. Our drive to see Our Domestic Lines find pathways through understanding of Policy and connection to Awareness to help on teamwork where we ALL meet as Citizen Stakeholders in the Economy and Financials across the divides seeking to support the pathways to Economic Growth and Full Recovery. Naturally this comes through evolution on the CFA path and a deep Passion for ALL things Quantitative, Qualitative and Communicative in nature and correspondent to a drive to grow on path of Economic and Legal skills. From the Foundation in the 1990s we had a passion for Policy and a will to help and Applied to the renowned Harvard Kennedy School for the MPA program and volunteered for NYC Government at the Comptroller's Office around the same time. Life has it's own plan and we ALL find paths for a reason which may or may not be immediately understood but if trusted and directed towards a productive goal to map to teamwork one tends to find pathways to growth and one of the most valuable investments that can be made in the Economy is an investment in one's self and knowledge. Like many we have found this to be an interesting Economy but the more interesting it becomes the deeper the need to reach an understanding of the levers of Macro and Micro Financials, Legal, Policy, Technology and Cross Sector Entities on teamwork to form the Economy and ideally support Individuals, Families and Communities as shareholders and as Citizen Stakeholders at home and abroad in the Larger Macro Picture. 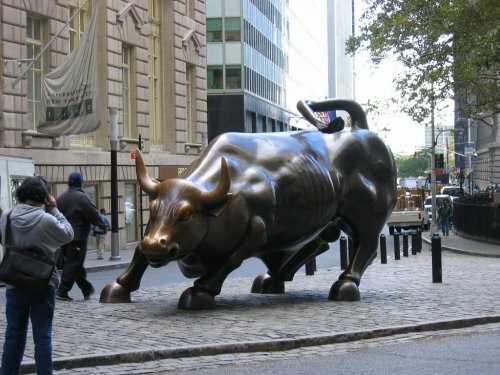 There is and always has been a unique relationship between the Financials at work on strategic and operational lines of Policy at work with Economics in the Broader Economy. From the powered days of growth from the recovery of the lull of the 1970s into the enginer of growth that was the 1980s we grew reading the Medical Journals, Loving Science, Having the Benefit of an Engineer, Mathematician, Doctor, Scientist, Cost Accountant, Fireman, Computer Engineer, Psychologist working on Case Work for Litigation and much more in the immediate sphere of knowledge and it's hard not to learn and absorb when your world is full of knowledge and you have a scientific and inquisitive mind to learn and grow (and are surrounded by highly intelligent and inspiring minds). The place where we grew was a fertile ground of some of the nation's finest minds and academic institutions so the osmossis of knowledge was a gift that we benefited from through regional growth. I vividly remember working in a health sector job and finding copies of the Economist, Forbes, Business Week and other Industry Publications and passionately reading them during the late 1980s and having been handed the Labor Economists report on Jobs in the Economy from a well meaning matron who somehow understood that I would need to be aware of it for future needs. I had a need to understand more of the passion of my Grandfather and Father for the market place and somehow eventually in the walk of life ALL pieces fit together for a reason and that reason at present has become quantitative growth and a cross map to model the Economy and consider the lines of the Macro and Micro Financials, Legal and Technology on Teamwork for cross sector needs on Macro level Policy and the more Micro needs of Entity Governance, Financials, Compliance, strategic and operational needs and the relevance to a broader Economic Model where Entities (Industry, NGO, Non Profit and Government at it's various stations ie local, regional, state, multi-state, national and global on trade) meet to a model of the Economy which should ultimately benefit Citizen Stakeholders in immediate terms of shareholders and broad terms of the needs at home and abroad in the Economy in that tiered order of needs. That's a long way to say that we are inclined to understand the broad model of the Economy and work with quantitative and qualitative research (applied research) as a value added layer to strong skills on Services on Accounting, Taxes, Compliance, Financials, Analysis, Project Management, Business Analysis, Audit, CFO, Controlling, and more from our experience including more junior lines on Programming and now very deep lines on Tech Sector, ICT, Programming, Communications, Data, Financials and Technology Research from which to help on the many of opportunities where financials and related lines on compliance connect on project needs on Growth, Risk Management, Governance, Compliance, Teamwork and Outreach (as more completely expressed in Our LOBs and around the webpage here and our brand lines). On a development line where services, research and outreach have walked hand in hand in the ups and downs of a complex economy we have grown a value which is resilient and tied to the more eternal needs of growth and prudent risk management in the Economy and Financials and a compass to find ways to help on Entity and Individual, Family and Community lines on needs in the Economy and Financials at home and abroad as we may based on supply, demand and that human element that makes the world a better place (as niave as it may sound) when we work together on teamwork to help on local, regional, state, multi-state, national and global challenges in the Economy and Financials. The value of continual learning and growth through services and applied research is a wealth of knowledge from which to help on needs on demand and our lines are now very much about integrated knowledge maps from which to help on key needs in the Economy and Financials through Quantitative and Qualitative Entity and Societal Research on the Macro and Micro Financials Legal and Technology on Teamwork and much more from the lines where Financials and the Legal Framework meet in the Economy and Financials on teamwork with Technology for the Data, Communications and Financial / Compliance needs. We bring a unique blend of cross functional skills, experience and applied research as our personal best to the lines for teamwork to help on project needs and that is the defined mark of the approach to needs from the DCarsonCPA lines. It is where we have evolved to in the realization of a significant achievement on Our lines of growth through continual improvements in knowledge of the Economy and Financials and finding that if the challenge is the Economy then the knowledge that is most in need to help is not solely the financials but it is the economic context in which value works in the Economy and Financials as the mechnism of growth and prudent risk management from which ALL Societal needs flow for improvements in the Economy. The understanding and growth on Aggregate lines strengthens the logical context to the more micro lines of Entity and Individual / Family and Community needs for success and improvement s in the Economy. It's alot to share, simplify and explain but we are looking to the top down and bottom up lines of many points where financials add value as the apex of our value to help on needs in the Economy and Financials (and value support on growth to Economist / Quant and Legal lines over time from which to help step by step on improvements in the Economy and Financials as the long run objective goals in the Economy and Financials. Work through financials makes this possible immediately and in broader terms as we evolve to participate on productive teamwork on Policy Awareness and growth from the lines of Transactional and Entity Accounting to the broader lines of related Policy and how any given Policy impacts the broader Economy as a frame of referance. It is commonly understood that there is a point constraint line where Economics and Accounting meet on the Cost-Benefit lines and that is a start point for greater legal and financial teamwork through technology from which to help on the Economy for the immediate needs of Entities and Individuals / Families AND for the broad needs of the Economy to ideally find our way back to Each Generation a Little Better Off in the Economy and Financials and we ALL know that the financials are a key part of the way to get ther from here and find and map cost-benefit constraints that can help on growth and improvements. The value that works for Entities and Individuals and Families bring similar value to the broader Economy. We are here to help and can map in significant lines of amost 6 years of deep lines on Economic Research (on top of 16 years foundation on Audit - CFO and Lean Management Consulting Lines including PM / BA roles) to the productivity lines of applied services in context to Macro and Micro Value, Leadership, Management, Teamwork and the optimal value of performance. We work with advanced Management, Finance and Accounting skills for High Performance needs with the full experience of CLevel and Senior Management and Entity support and ownership of key accountable roles on Entity Financials for the value where the Practical and the Academic meet in real time for the best of both lines on mapped in value improvements as we take the refined knoweldge of Big Data lines as an Asset to help on needs on Client Services in the Economy and Financials as is the best of potential in this knowledge age of integrated services and research in our business model. The skills and experience gained and delivered in these roles ran from Retail (Public Relations / Products Management) then to a career path from Fortune 500 Audit through CFO ready Controlling (for Services driven Business Models including Job Costing for mixed Product and Services Business). I have worked closely with Board Members, Partners, Principals, CEO's, CFO's, COO's, Corporate Council and Legal Compliance, Directors, External and Internal Business Partners, Bankers, Investment / Portfolio Managers, Traders, Sales People and all levels of Corporate Staff. I am highly skilled in Controlling, Analysis, Reporting, Compliance (Investment Acts 1940 covering Investment Advisors and Investment Management / Asset Management Firms and SEC Rule 17a-5 Focus / Net Capital Reporting under SEC Act 1934 15c3-1 &3 covering Broker-Dealers), Research (for GAAP, IFRS, Tax and other laws and rules), Accounting Systems, Financial Planning and Analysis and more. These skills as listed above are highly transparent and transportable and not limited to industry or segment. For any areas requiring specialized technical support I am linked in to the AICPA, adept at work with Regulators (SEC and FINRA) and the IRS, and am expert in Accounting Research. I am interested in volunteer services opportunities that can be supported along with standard business flow and in training new accountants as my practice grows. I have been a successful Accounting and Reporting coach for several CEOs, a Newly Elected Board Member of a Credit Union and a Professional who pursued a Certificate of Accounting with great success. I have proven skills in sharing Accounting and Reporting knowledge and supporting growth for Professionals interested in expanding their command of Accounting and Reporting skills. We are here as a key resource for Financial Service Entities along the lines of our Expertise with Investment Management/ Asset Management, Broker-Dealers (not Audit at present), Registered Investment Advisors, Capital Markets, Commercial and Investment Banking and more with ability to deliver on Full Range Services for Private Companies at Present (currently not Auditors for Broker-Dealers but available for all other services). We are also here for General Businesses and Individuals who can benefit from our experience with Accounting and Consulting and full range CPA Services that include not for profit and government roles. We look forward to being a key Business Solution for your Business and Individual needs for CPA Services, Consulting and Business Analysis. I am a Licensed NYS CPA with 15 years of Business Experience helping Businesses and Individuals reach their goals by delivering High Quality Financial Reporting and Analysis with Ethics, Integrity and Professionalism. High Standards of Accountability - The Mark and difference of a CPA. It has been written that a hallmark of a profession is it's acceptance of Public Responsibility and in being a licensed NYS CPA, registered in NY and CT for CPA Services and Tax work, I am held to high standards of Accountability and you can be certain that I will be committed to delivering top quality work for my clients as I have been throughout my career in Permanent and Consulting roles prior. I have enjoyed a wide range of successful roles as a Senior Consultant to key leaders in Financial Services (CEOs, CFOs, COOs, Board Members and other key leaders), CFO Ready Controller, Business Analyst and key management professional, growing with Clients and delivering streamlined Accounting Services for all purposes Controlling, Operations, Management and Financial Reporting, Research, Accounting Systems, Capital Raising, Taxation, Regulatory and Compliance and more. I am looking forward to working with you and your Business to help you grow and cover your CPA services, Accounting, Reporting, Taxation and other customized needs for services. 917-300-5190 or 917-231-7855 to best discuss the many ways we can help.